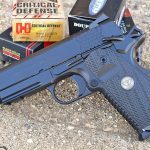 Mike Detty tests out a version of the Wilson Combat X-TAC Elite Carry Comp pistol that features an aluminum frame and is chambered in 9mm. Though the author’s test pistol featured an aluminum frame to save weight, it still came with a Picatinny rail machined into the dust cover. 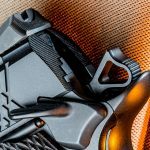 Wilson Combat outfits the X-TAC Elite Carry Comp with its skeletonized concealment hammer as well as an ambidextrous thumb safety. 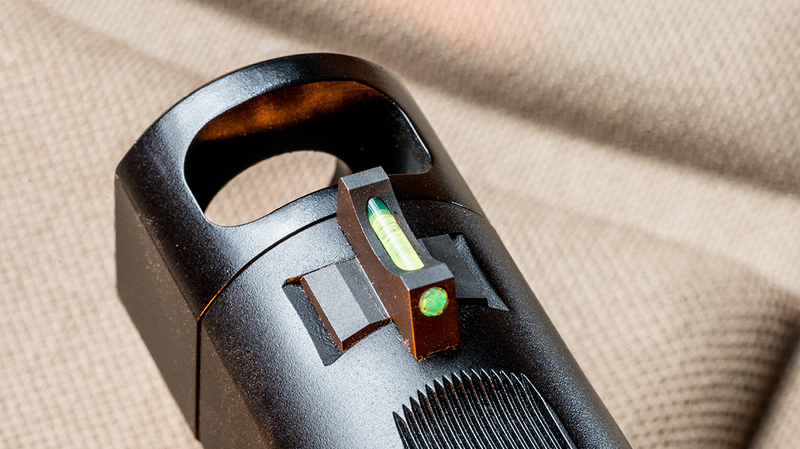 For sights, Wilson includes a green fiber-optic front sight. The rear Battlesight has a deep U-notch and 40-lpi serrations matching the slide’s. Measuring roughly 0.62 inches long, the single-port compensator helps cut down on muzzle rise for faster follow-up shots. 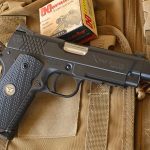 While the author tested a 9mm model, Wilson also offers .45 ACP versions that use seven-round magazines. 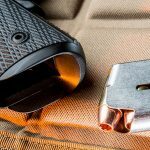 The one-piece mainspring housing/magazine well provides a guide for quick reloads under pressure. 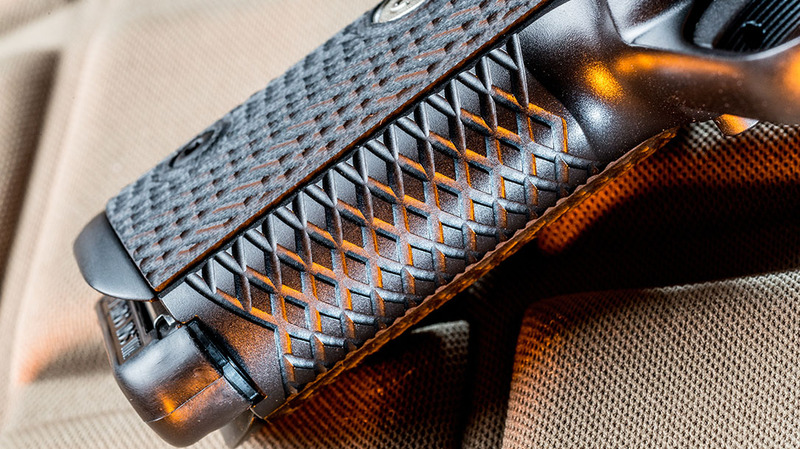 The frontstrap and mainspring housing sport Wilson’s unique X-TAC serrations just like those on the slide. The G10 grip panels feature similar texturing for a sure hold, even if your hands are wet or sweaty. 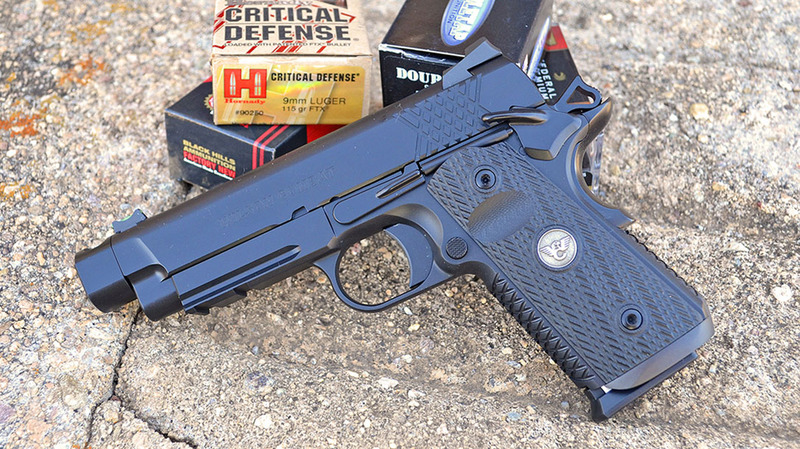 Wilson guarantees its pistols will shoot 1.5-inch groups at 25 yards, and the Carry Comp certainly lived up to that. 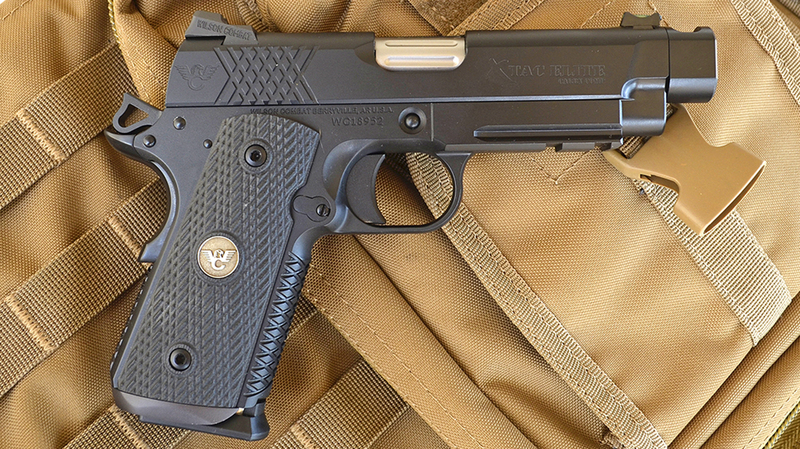 Last year, I had a chance to evaluate Wilson Combat’s X-TAC Elite Carry Comp pistol. Designed for concealed-carry use, the .45 ACP pistol was built from the ground up to give its user every advantage in an armed encounter. From its distinctive frontstrap treatment to its florescent front sight to its integral compensator, the pistol is as lethal as it is good looking. 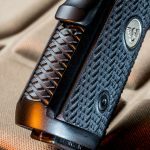 Apart from its cosmetics, the gun is testimony to Wilson Combat’s dedication to attention to detail, with every part being fitted by hand. Its performance is exactly what you’d expect with flawless reliability and laser-like accuracy. But its steel frame made the gun heavy for concealed carry with an unloaded weight of 38 ounces. 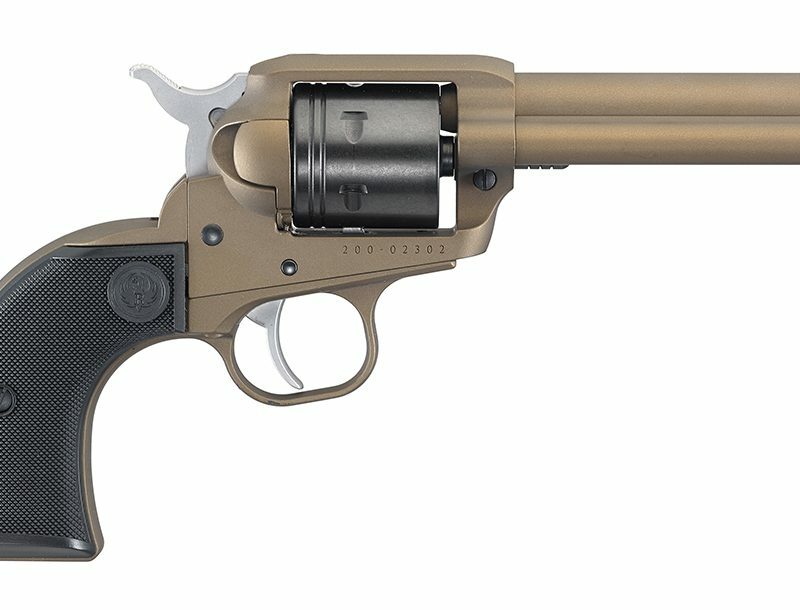 Is the Wilson Combat Pinnacle Pistol Really Worth $8K? 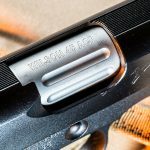 In correspondence with Bill Wilson, the owner and founder of Wilson Combat, I asked if the X-TAC Elite Carry Comp could be built on an aluminum alloy frame. 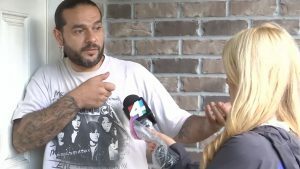 His response was, “Yes, of course we can. Should I build one for you in 9mm?” A month or so later my sample gun arrived. 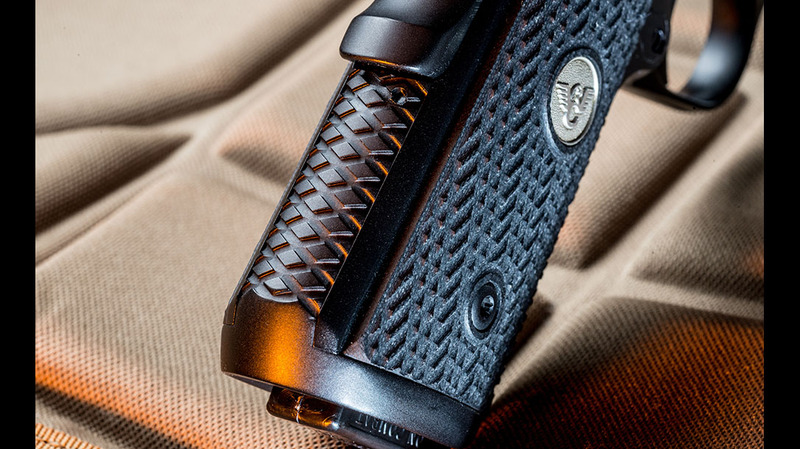 This particular X-TAC Elite Carry Comp is built on a compact Officer’s-sized frame. Using an aluminum alloy frame, rather than steel, shaves almost a half pound off the weight of the gun. Its barrel length is similar to the Commander model, measuring 4.5 inches with the compensator included. The result of the compact frame and shortened top end is a lightweight and fast-handling gun that is a joy to carry. 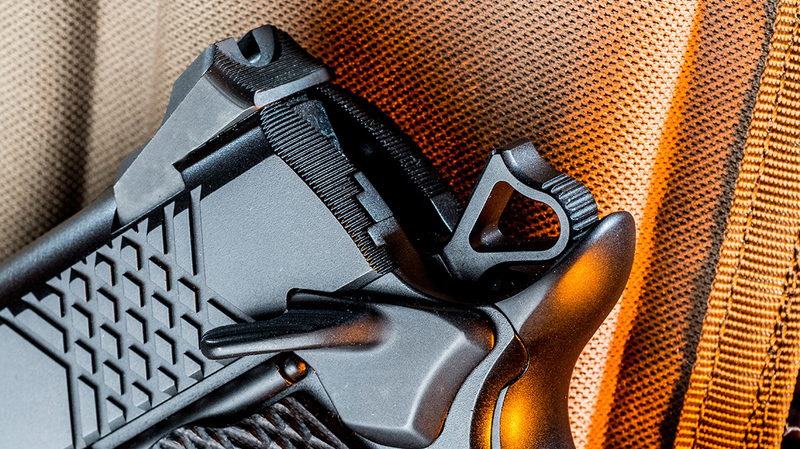 The pistol has distinctive X-TAC slide cocking serrations and frontstrap texturing, and the criss-crossing grooves give water, or any fluid, a place to go while the shooter’s hands lock into these same grooves for a rock-solid firing grip. 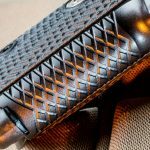 It provides a secure grip without the abrasive feel of checkering and doesn’t snag on clothing the way checkering can. This same texturing is carried over to the mainspring housing. The one-piece housing and magazine well funnel are expertly blended to the frame and basically double the size of the magazine well opening for quick and certain reloads. This part adds 0.25 inches to the length of the backstrap, and yet this seemingly small extension makes the gun very controllable. I had no problem getting all three fingers of my shooting hand on the frame’s frontstrap so, despite being a compact frame, there is no compromise in my firing grip. 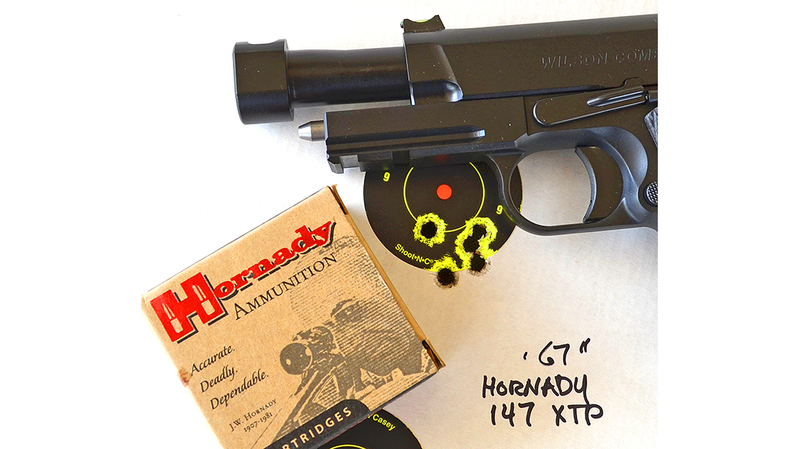 Bill Wilson chose a medium-length trigger for this gun. Not too short and not too long, it’s just right for the Carry Comp. The magazine release is slightly extended, and the slide release has a slight ledge on it for easier engagement without extending its length. My preference on a carry 1911 is a thumb safety that is as crisp as its trigger. I absolutely need to know when it is engaged and disengaged. In the case of my Carry Comp sample, the thumb safety disengages crisply with 4 pounds of pressure. The part is slightly extended with no sharp edges, and it’s just about perfect for concealed-carry use. For concealed-carry use, the Carry Comp is outfitted with a short beavertail with a “memory bump” to ensure the grip safety is depressed even when using a thumb-high grip. A skeletonized Wilson Combat concealment hammer is also used for a smaller profile. Machined from tool steel, its light weight provides for faster lock times. 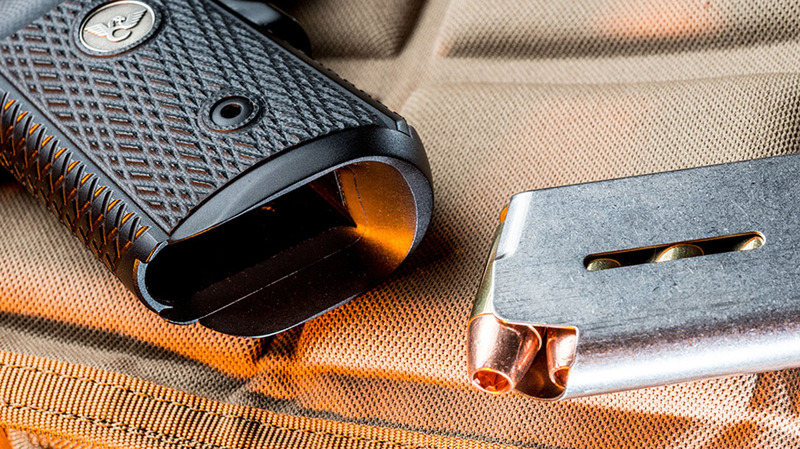 A Picatinny accessory rail is machined into the X-TAC Elite Carry Comp’s dust cover. The ability to add a tactical light and/or laser to a concealed-carry gun can be an absolute advantage, and I’m glad to see its inclusion on this pistol. 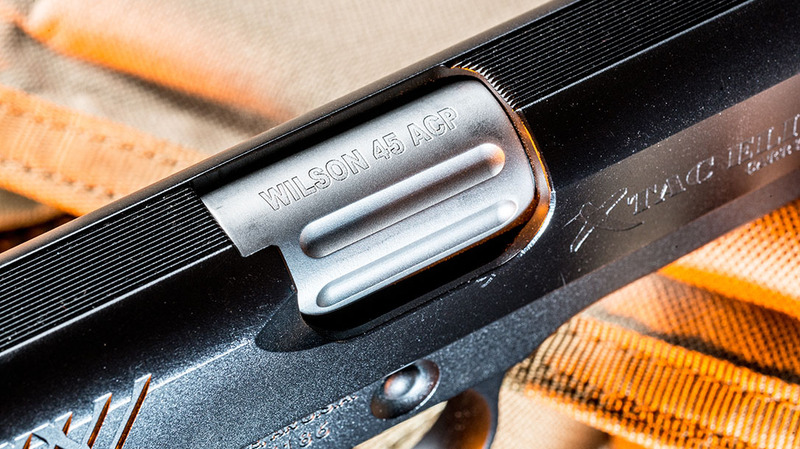 Wilson has flattened the top of the slide and then added fine serrations to prevent glare. The ejection port is also enlarged for unimpeded ejection, and there is also a rollover flare designed to prevent damage to the ejected brass. 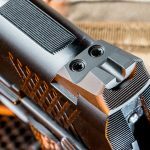 An internal extractor is used on the X-TAC Elite Carry Comp, and the back of the slide sports the same 40-lpi serrations as the backside of the rear sight. The rear sight is very nice. Designed by Bill Wilson himself, the Battlesight has a deep, 0.145-inch-wide “U” notch for low-light sighting. A semi-circular pocket is cut into the rear of the sight as well to present a clear, sharp sight picture. 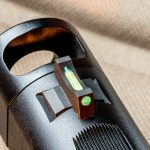 The front of the rear sight also has an angle sharp enough so shooters can use it to rack the slide on a belt, boot, table top or whatever surface is around with just one hand in case the other is incapacitated in the direst of circumstances. 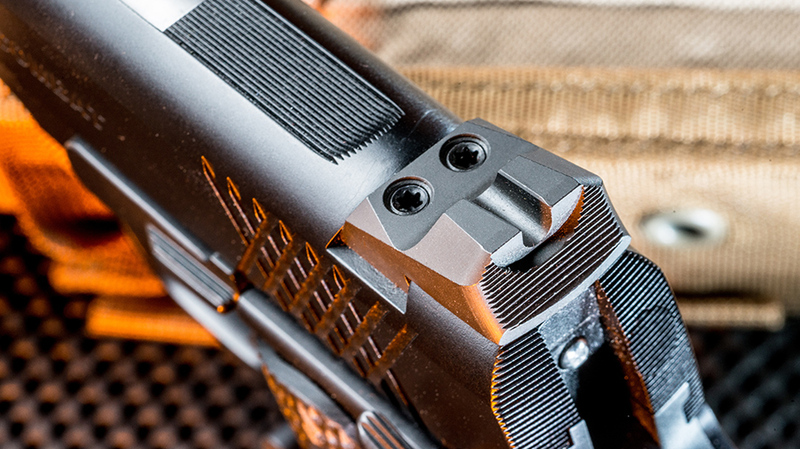 One of the most attention-grabbing features of the X-TAC Elite Carry Comp is its compensator. 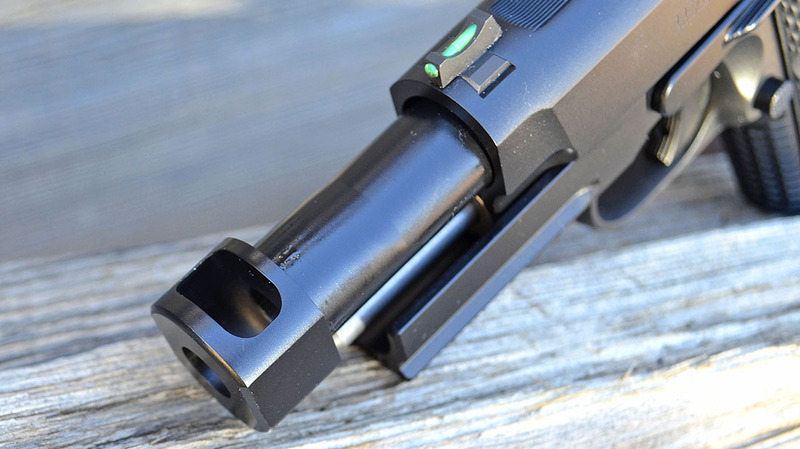 Unlike most other designs out there, this part isn’t threaded onto the barrel. 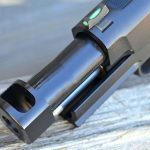 The barrel and compensator are machined from one piece of steel to ensure that the latter won’t unthread at an inopportune time. 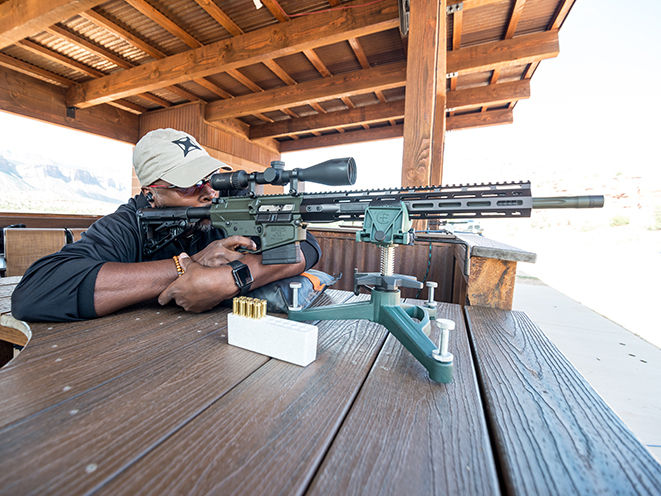 Measuring 0.62 inches in length, the single-port compensator is designed to vent muzzle gases upward to keep the muzzle flat during rapid-fire string. The barrel itself is tapered and does not use a bushing. The total barrel length, including the compensator, is 4.5 inches. My 9mm test sample used a ramped and supported barrel with a feed ramp that was polished mirror smooth for flawless feeding. The rear of the barrel features two shallow flutes designed to give dirt and firing residue a place to go rather than tying up the slide, and a full-length recoil spring guide is used along with a single flat wire recoil spring. 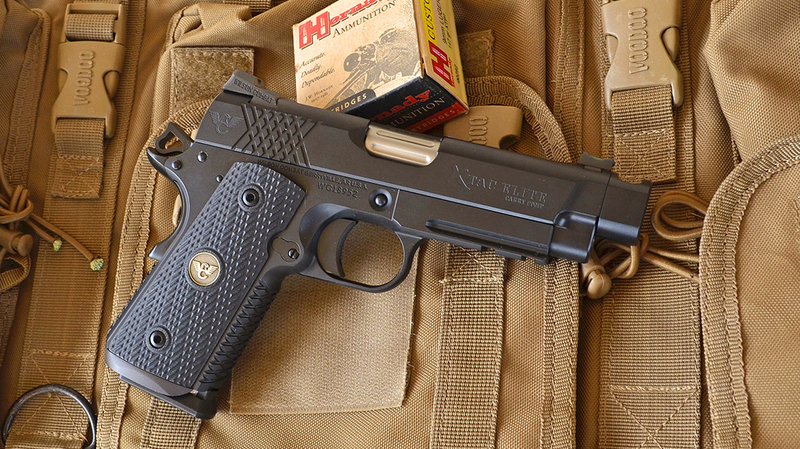 Finally, the X-TAC Elite Carry Comp is coated with Wilson Combat’s rugged Armor-Tuff finish. My test sample wore a satin black, non-reflective finish, but other colors are available. Wilson designed the finish to resist abrasion and corrosion, its lubricity factor means that these coated parts require less oil. Wilson Combat is one of the few manufacturers to actually offer an accuracy guarantee with its pistols, guaranteeing 1.5-inch groups at 25 yards. On a very breezy Tucson summer day. I set up my targets at 25 yards and fired all of my groups from my DOA Tactical portable bench utilizing a Millett BenchMaster for additional support. I soon found out that the X-TAC Elite Carry Comp is at least as accurate as I can shoot it. It shot exactly to the point of aim, so when I used a 6 o’clock hold, the groups printed right at the bottom of the 2-inch Shoot-N-C targets. The Carry Comp’s trigger made shooting groups a joy. It broke at just under 4 pounds and proved to be consistent, predictable and had a firm reset. The trigger had just a tad of pre-travel to prep it, and the overtravel was virtually non-existent. Also aiding me in shooting such small groups was the excellent sight picture. The front sight’s sharp shouldered housing aided in a precise sight picture; the green insert helped me keep the sight centered while I added pressure to the trigger. What is really profound about my groups is that despite the 70-grain variance in bullet weights, not a single ammunition printed a group that was outside of Wilson Combat’s accuracy guarantee. I had a lot of fun shooting the Carry Comp. 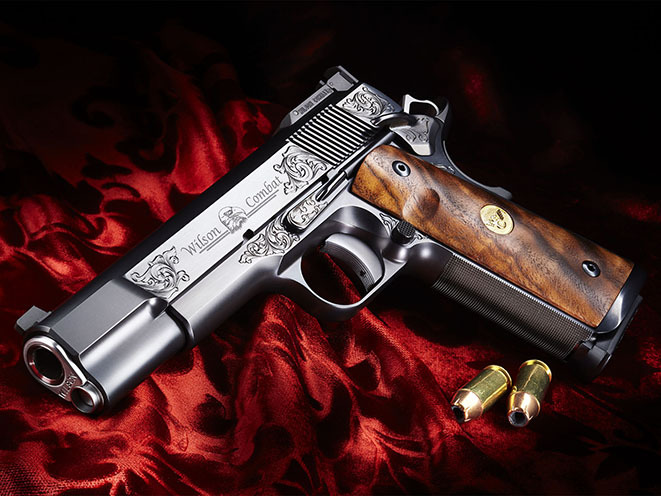 It is an abbreviated 1911 with a lightweight frame designed for 9mm ammo. Using an MGM BC-C Zone target, I was able to place 10 rounds on the steel in under two seconds. 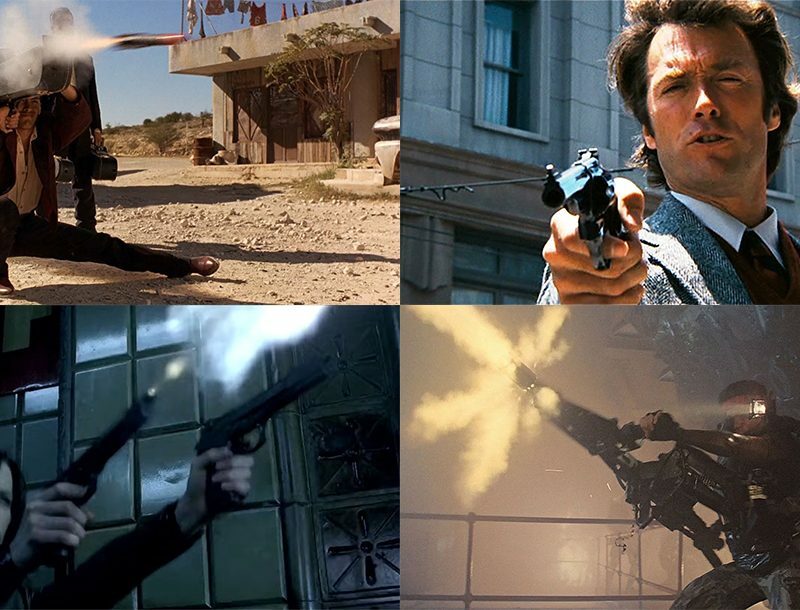 Even with the hotter self-defense loads, the sights never seemed to come off the target during rapid fire. At 15 yards, my double-taps landed within 2 inches of each other. It is an amazingly easy gun to control. Being an old 1911 guy, the familiar grip angle felt comfortable to me, and the manual safety was extremely intuitive. 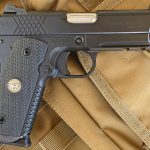 Priced just shy of $4,000, the Wilson Combat X-TAC Elite Carry Comp may not be within the reach of everyone’s budget, but for the 1911 connoisseur, it may just be the cheapest life insurance available. If you’re the type who values quality and precision craftsmanship, the Carry Comp is a gun you can bet your life on. *Bullet weight measured in grains, velocity measured in fps by chronograph and accuracy measured in inches for the best five-shot group at 25 yards. 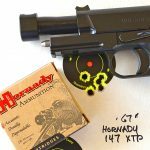 This article is from “Handguns Buyer’s Guide” 2018. To order a copy, visit outdoorgroupstore.com.